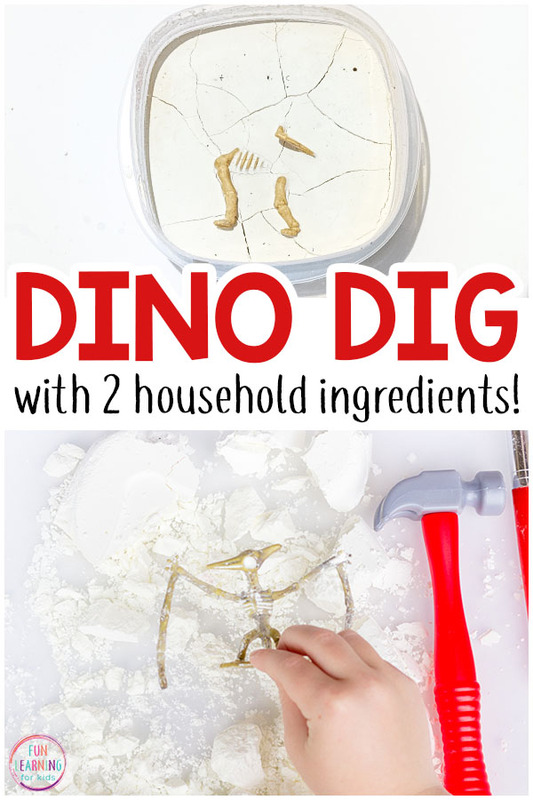 Did you know that you can make your own dinosaur dig excavation activity? All you need is two household ingredients and a few sunny days. It couldn’t be easier! 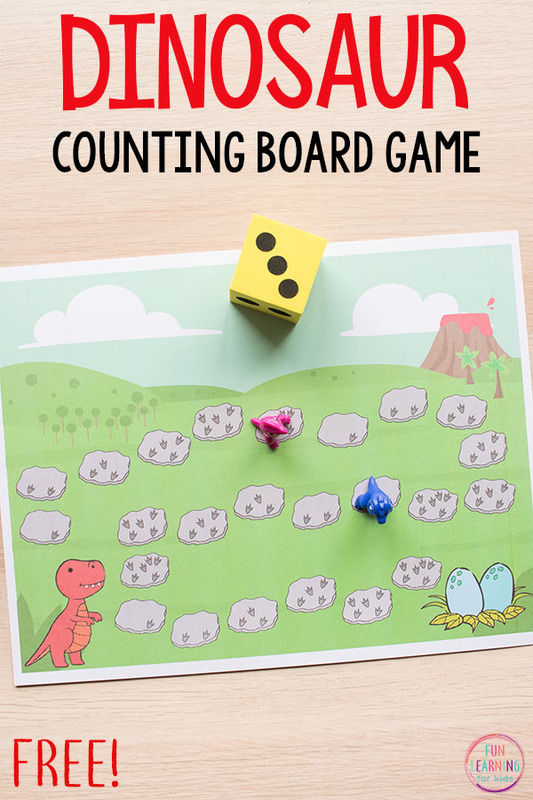 So if you are looking for a simple dinosaur activity to do during a dinosaur theme or just for fun with the kids, this science activity is perfect for you! 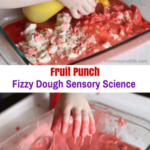 For even more science activities for kids, check out these science activities that will amaze the kids and these science experiments for preschoolers! So many kids love dinosaurs and my son is definitely one of them . 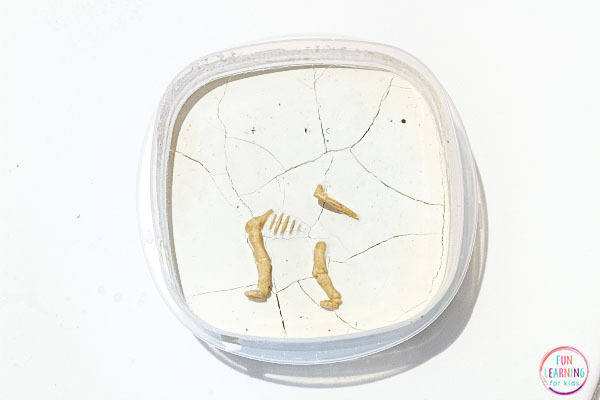 When is was much younger, I did this neat dinosaur fossil excavation activity with him and made these dinosaur dig fossil puzzles. He still loves dinos and my four-year old daughter does now too. So I thought it would be neat to create an even more realistic dinosaur dig excavation for them to do this summer! 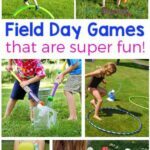 And because it’s so easy to make, you can do this again and again all summer long. 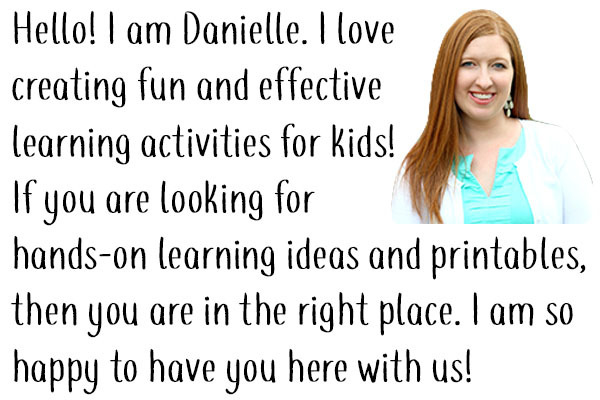 Even better, this activity really has two components. 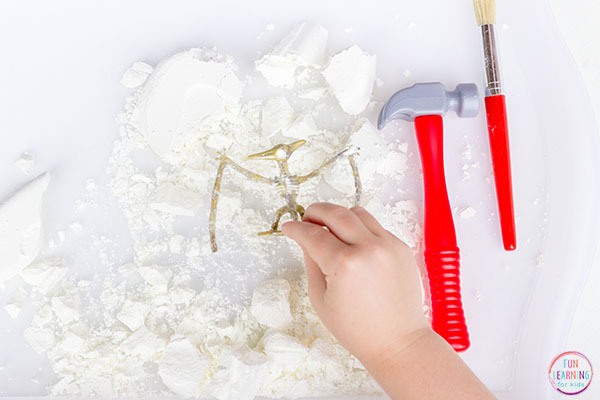 Kids can explore oobleck and it’s super cool properties. Sometimes it is a solid and sometimes it is a liquid. 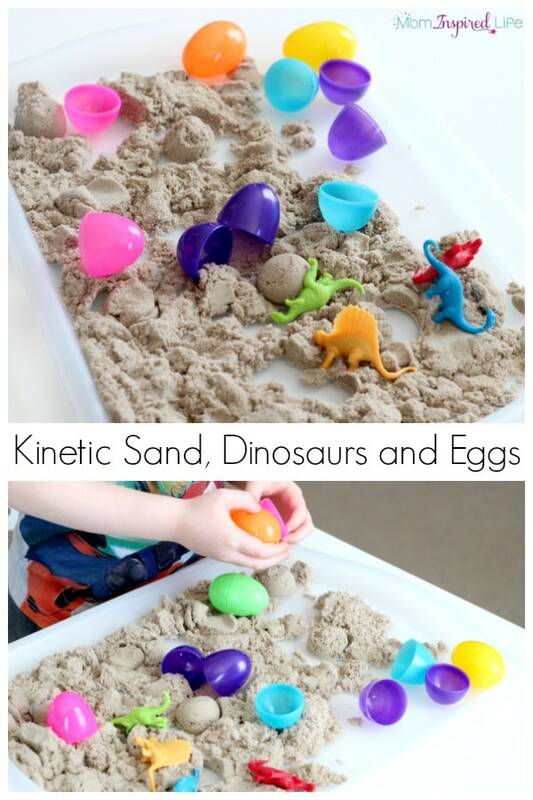 After that, you can use the oobleck to make this awesome dinosaur activity! I knew that oobleck (or goop) could be left out in the sun to dry and it would harden up, so I thought it would be cool to put our dinosaur fossil skeletons in some oobleck and leave it out in the sun to dry. So that’s just what I did. And it turned out amazing! 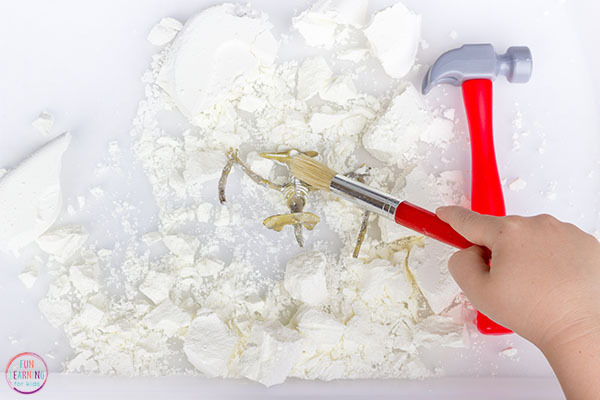 Grab your toy tools, paintbrushes, toothbrushes or any other tools you think could be used to dig out the dinosaurs. 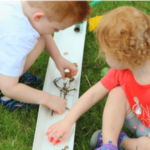 Put them next to the dinosaur excavation container and invite your child to enjoy this fun dinosaur dig excavation! Evan was super excited and began using the hammer to break apart the hardened oobleck. 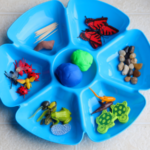 He used a play dough spatula to get some of the chunks off of the dinosaur skeleton. Once he had freed the dinosaur completely, he used the paintbrush to dust it off. 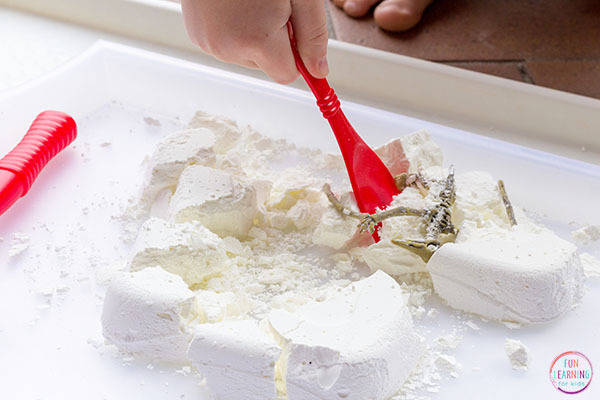 After he dug out the dinosaurs, he had a lot of fun playing with the remaining chunks of the hardened cornstarch mixture. He crumbled them in his hands and hit them with the tools. He even put the dinosaurs on them and pretended they were huge boulders. 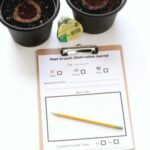 This simple homemade dinosaur dig excavation kit is well worth the 5 minute prep involved and so much more! We will definitely do it again this summer! 1. 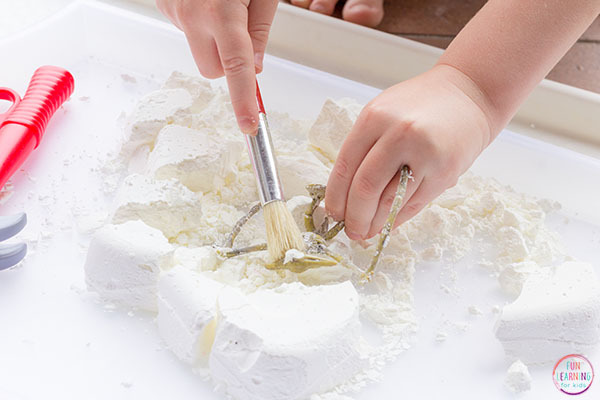 Mix up some oobleck by combining cornstarch and water. 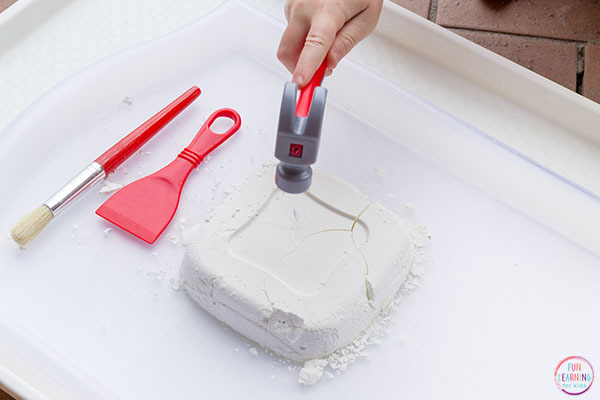 I am not giving exact measurements because it will depend on the size of the container you are using and how much cornstarch you have on hand. 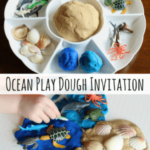 You will want to use approximately twice as much cornstarch as water. So if you use 2 cups of cornstarch, you will use 1 cup of water. If it is too soupy, add more constarch. If it is too thick, add more water. 2. Put the dinosaurs into the oobleck. You will want to push them down as much as possible to so that they are buried. I put one dinosaur in a few of my containers and two dinosaurs in others. 3. Put outside in the sun and leave it for a day or two. It rained, so I had to bring mine in and then put it back out, so I ended up waiting about 2.5 days. You will know when it is ready because it will get very hard and it will start to crack all over the surface. 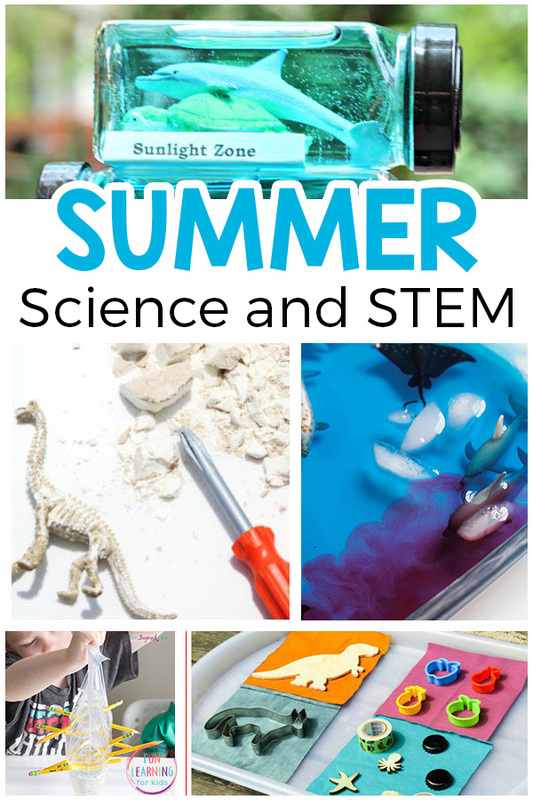 You might also like these awesome summer science activities for kids! 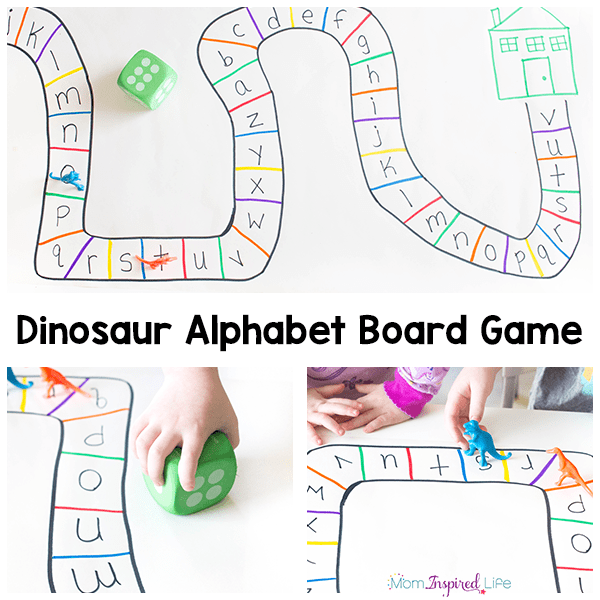 Check out these other fun dinosaur activities for kids!